The other athletes are women's shot putter Svetlana Krivelyova of Russia, discus thrower Irina Yatchenko of Belarus, who both won bronze medals in their disciplines and Belarussian hammer thrower Ivan Tsikhan who lost his silver medal. Three-times world champion Tsikhan had also lost his bronze medal from the 2008 Beijing Games but the decision was overturned at the Court of Arbitration for Sport because of a laboratory procedural error. A case involving a fifth unnamed athlete is still pending, the International Olympic Committee said. All four had tested positive for anabolic steroids when some 100 samples from the Games eight years ago were retested for banned substances with more modern methods earlier this year. The IOC stores samples for eight years to allow for re-testing for newly discovered substances or for those substances for which there was no test available at the time. "You always want to wait until science gives you the most sensitive tests," IOC President Jacques Rogge told reporters. "When we retested the athletes for Athens they had undergone testing that was negative (during Athens)." "Since then there has been progress, we were informed about better tests and new tests. The more time you have, the bigger the chances that science will deliver better tests." With Bilonog losing his medal, doping has now claimed both men's and women's shot put winners of the competition staged at ancient Olympia, a move that was aimed to bring the modern version back to its ancient roots. 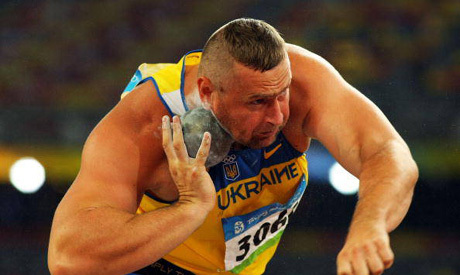 Irina Khorzanenko lost her shot put medal after testing positive for the steroid stanozolol. The total tally of doping cases from the Athens Olympics is now 31 after 26 positive tests at the time, which was the most in any Games.